You may have heard a shipwright, or even millwright, terms that connote a level of proficiency and artisanship in a trade. A lesser known term in the same family is housewright—a homebuilder who has undergone a rigorous apprenticeship to become a master in the craft. In an age of pre-fabricated houses and cutting corners for profit, meticulous attention to detail and masterful work is rare. But Home Enrichment, based in Dutchess County's Hopewell Junction has an unparalleled reputation for excellence in the realm of home construction and renovation. Read our feature on the owners and their skilled team of builders. Home Enrichment, led by husband-and-wife duo Josh and Aimee Rich, has undertaken many projects throughout the Hudson Valley, each a showcase of the team's care. 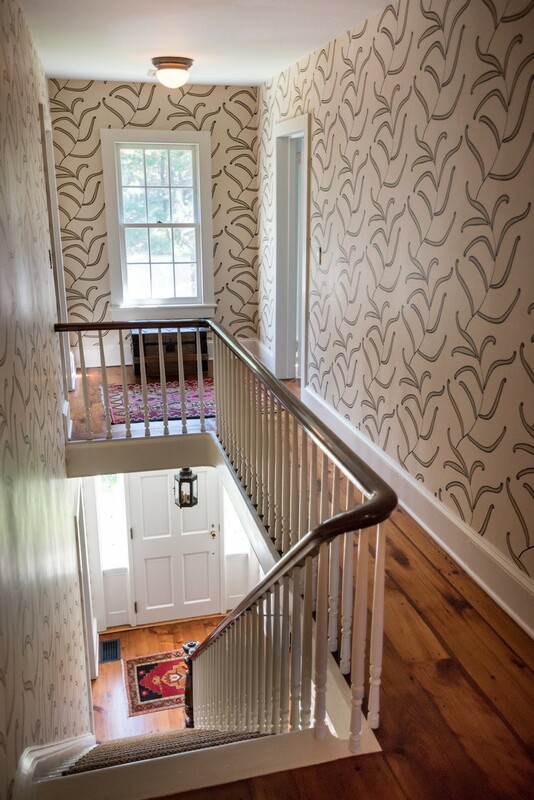 One such icon is the farmhouse renovation they did in Millbrook, NY, in collaboration with architect Jimmy Crisp and interior designer Constance (Connie) Newberry. The Millbrook project constituted a major addition to a charming house. 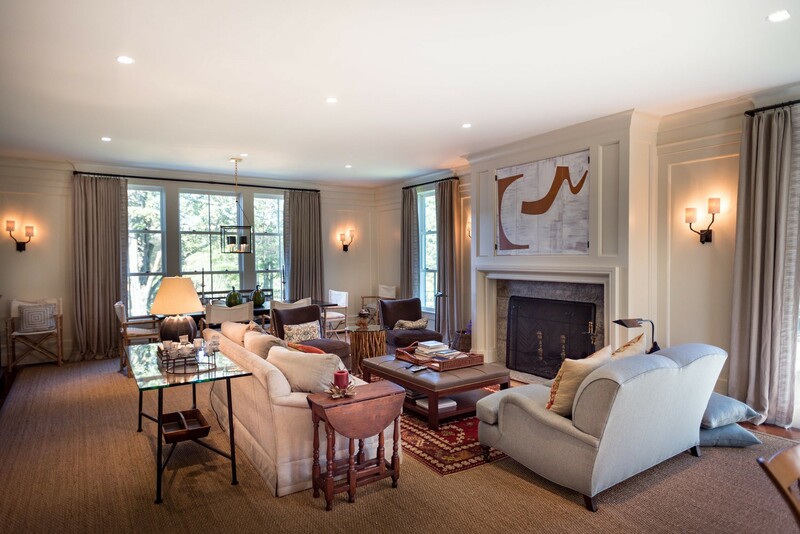 The Home Enrichment team, comprised of seven master craftsmen built an entire new wing, complete with a full basement, nearly doubling the home's square footage. In the above photo, the section with the awning is the original 1800s home. "The whole left side, including the porches and porticos is all new, as well as the porch on the right," Aimee Rich says. The whole project took about 18 months to complete—no small feat for that scale of undertaking. "We were really happy to finish it in that time frame, especially considering how particular the guys are," Aimee says with a laugh. "It's a big deal—sometimes a project like that can take 24 months." The goal for the addition was to increase the living space, while keeping with the classic, country aesthetic of the original farmhouse. "We wanted it to stay true to what it was," Aimee says. "I think we succeeded. Although the addition is very large, it still feels warm, welcoming, and quaint." The hallway in the above photo was part of the original house, but the stairs are new—hard to tell the difference right? The Home Enrichment team worked hard to match the new flooring with the existing pine boards. "We search high and low to find antique treads," Aimee says. 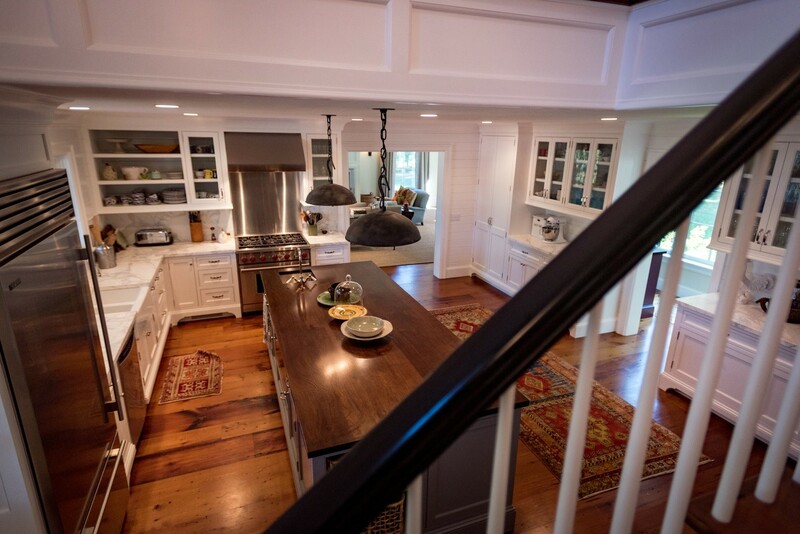 Josh adds,"The flooring was reclaimed from 100-year-old beams from a timber- frame barn. 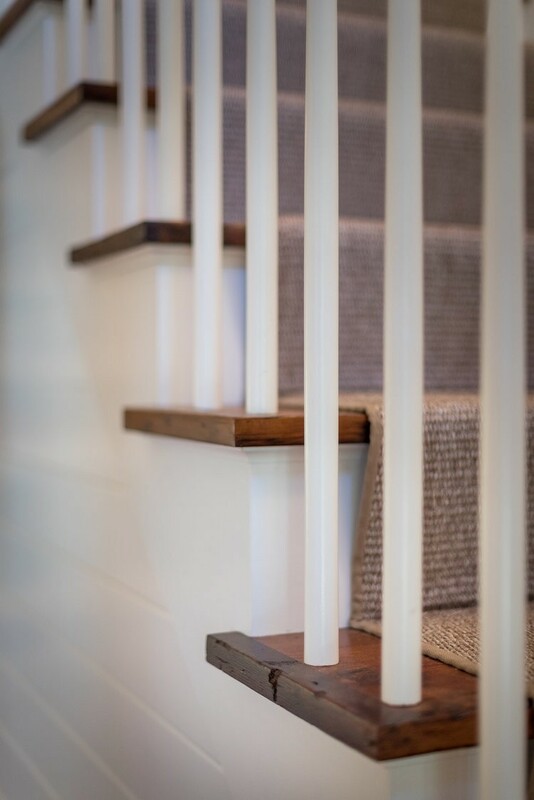 We had the timbers milled and turned into flooring." They also took the additional step of refinishing all the wood throughout the original house so that it would have even color and patina. 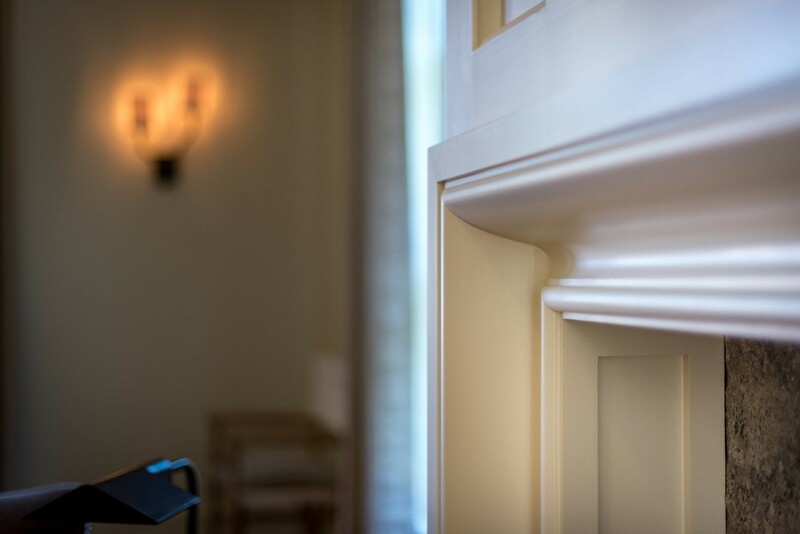 The team prides itself on meticulous attention to detail at every level from the big vision down to the finest finishing touch. "Take the mantle surround in the family room," Aimee says [see right]. "There are no gaps—everything is flawless. It is a nice piece of art. When you go into a lot of homes, the joints are not tight, or they're coming apart and it feels flimsy." 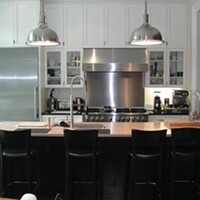 The kitchen with its marble countertops, walnut island, farmhouse sink has a cool but cozy look. "I love that there are stairs in the kitchen—it's charming," Aimee say. "Years ago, there were always back staircases for butlers and maids. 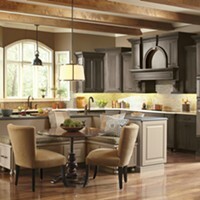 Things aren't how they used to be, but the kitchen is still the heart of the home." The kitchen is certainly a central point in this Millbrook farmhouse—in addition to the flight of steps leading to the second floor, there are exits to the family room, the butler's pantry, and a vestibule that takes you to the living room and mudroom. 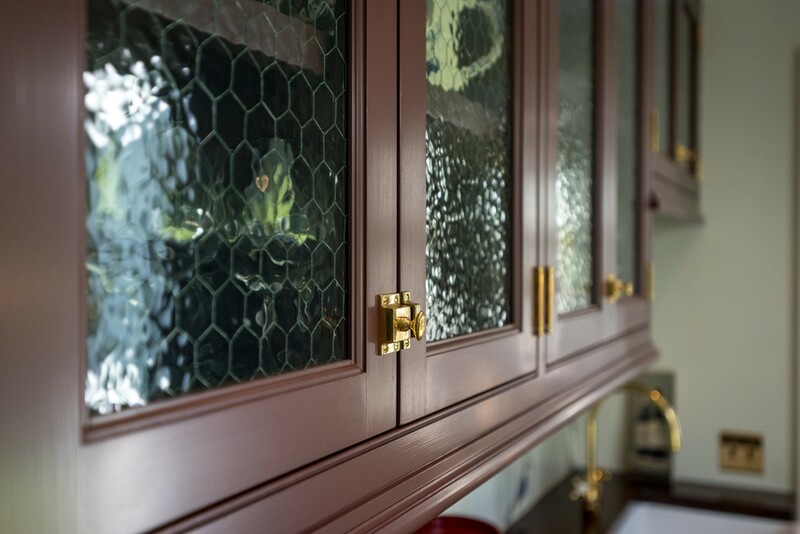 For the butler's pantry, Home Enrichment built custom cabinet doors using Bendheim architectural glass with chicken wire. "The homeowner wanted to keep it feeling like a farmhouse," Aimee says. "That meant having some elements that felt pastoral and old-fashioned, like the chicken wire." 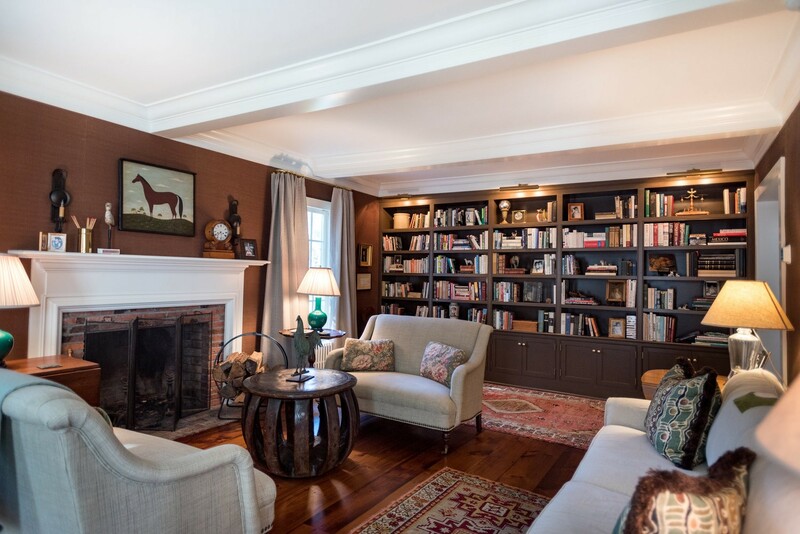 In the living room of the original house, the Home Enrichment team manufactured and installed built-in bookshelves, added library lights, created the coffered ceilings, and re-wallpapered. "The owner had impeccable taste," Aimee says, "The way her home turned out is a reflection of who she is—warm and friendly yet refined." 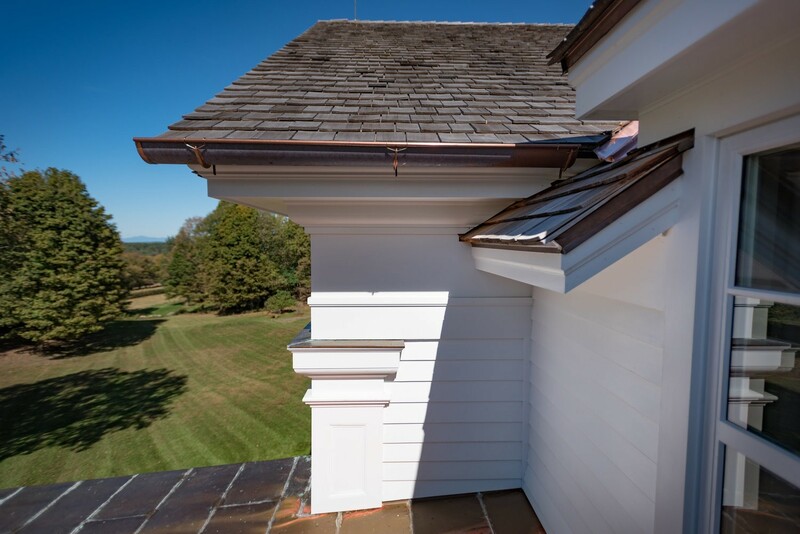 The roof of the porch on the addition is made of flat-seam copper panels, while the main roof sports cedar shakes with copper gutters that tie the two together. In addition to all of the interior work, the Home Enrichment team also fabricated all of the exterior trim. For the exterior trim, the company uses a product called Versatex, which is a PVC composite. "It may sound weird to say we are using PVC on the exterior of a house, but we like it because it lasts forever and ever and ever and we’re not killing trees," Aimee says. In general, the company keeps a mind to sustainability when doing construction and renovation projects, opting for energy-efficient windows, heating and cooling systems, and kitchen appliances. Despite the new updates, the Millbrook farmhouse has retained its air of vintage charm. "We touched every room in house minus master bedroom, and we are proud of keeping the integrity of the home," Aimee says. "Yes, its an updated farmhouse, but it's still got some old soul to it."